↑ 5,0 5,1 McDONALD, David John, (David Tennant). Who's Who. A&C Black (2008) pristupljeno 10. travnja 2009. Online edition Oxford University Press Dec 2008 (subscription or library card required). ↑ 6,0 6,1 6,2 "Desert Island Discs with David Tennant". Desert Island Discs. BBC. Radio 4. 2010-01-01. ↑ Scott, Marion. "The Secret Diary of Dr Who, aged 14 3/4", The Sunday Mail, objavljeno 27. studenoga 2005. pristupljeno 8. studenoga 2007. ↑ Foss, Roger. "Partners in Time", What's On Stage, objavljeno July/August 2008, str. 15. pristupljeno 6. srpnja 2008. ↑ Shannon, Sarah. 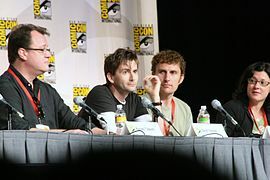 "David Tennant: His days of blissful anonymity are numbered", The Independent, objavljeno 7. prosinca 2005. ↑ Nathan, Sara. "Dr Peter is back in the Tardis", The Sun, objavljeno 21. kolovoza 2007. pristupljeno 22. kolovoza 2007. Ova je stranica posljednji put uređivana dana 19. srpnja 2017. u 20:30.